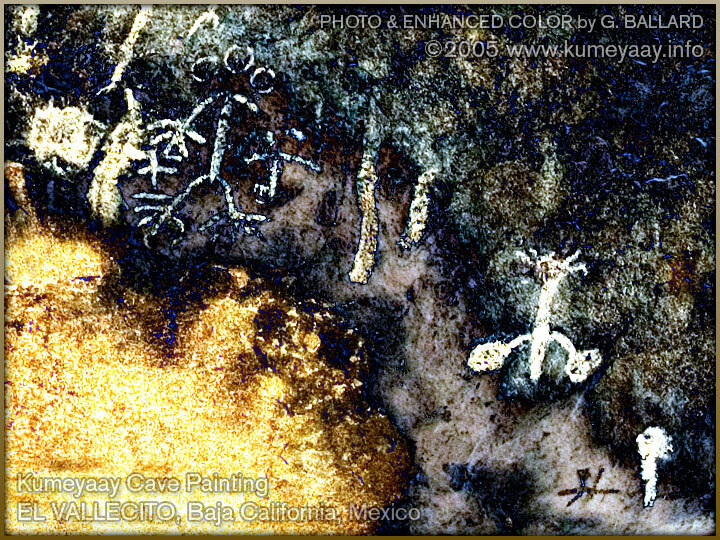 GARY BALLARD digitally enhanced the colors and tones in this Kumeyaay cave drawing and used it as the lead image in his San Antonio Necua "Kumiai Fiesta" movie DVD documentary. As these ancient "stickman" anthropomorphic pictrographic images fade and morph in the movie beginning sequence, an ancient Kumeyaay style elderberry flute plays a unique background melody in the prehistoric, precontact North American Indian aboriginal scales. "I can't say what other people may see or feel about what I frame inside a box, but this enhanced cave image is one of my most amazing and favorite Kumeyaay images of all time to look at and think about here in the 21st Century." I've included the original color picture in a ROLLOVER underneath the top photo -- just move your mouse cursor the photo and it will rollover the photos's original unaltered color and tones. The archeological experts today believe these cave pictrograph drawings were painted by Kumeyaay Indians some time in the distant past, and the archeological evidence in the El Vallecito area suggests the Kumiai aboriginal peoples have lived in this area for thousands of years. For information ABOUT GARY BALLARD. Gary G. Ballard is the founder, editor, designer and webmaster of the KUMEYAAY.INFO website. G. BALLARD took this picture with a digital still camera in an old Indian cave in Mexico near the US-Mexico border, El Vallecito, Baja California, in 2005. El Vallecito is nearby La Rumorosa, and about 20 miles south of the Tecate border crossing point.